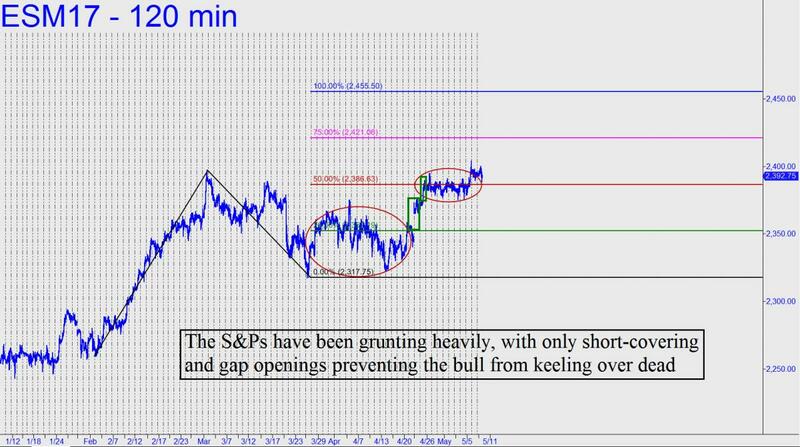 We have unfulfilled targets as high as 2492.50, but the 2355.50 Hidden Pivot shown in the chart can serve for now. I like the 120-minute graph here because it shows the rally for what it is: a labored, grunting affair whose progress has been wholly dependent on short-covering rather than steady buying. Moreover, virtually all of the gains since mid-April have come via gaps at the opening bell, and even then it has taken as long as three weeks to consolidate for the next push, all of which have been relatively modest. Another reason for skepticism is that the short-covering binges have been triggered by news, most of it unsurprising and already well discounted. The distance between where the futures are trading now and the 2355.50 target is equivalent to about 500 Dow points, yardage that bulls could easily have traversed in two or three days in the not-so-distant past. But you can see in the chart that a push to the target could take several weeks if things continue as they’ve been. We’ll maintain our bullish trading bias for the time being nonetheless, but we should be ready to reverse polarity if an intraday downtrend generates a bearish impulse leg on this chart. That hasn’t happened for seven weeks, but the next time could be warning of real trouble.